In North Carolina, over 46,000 people earn their living from the pork industry. In addition, more than 80 percent of our hog farms are owned and operated by individual families. With so many folks depending on us, we have an awesome responsibility. It’s a responsibility we take very seriously. Doing the right thing for producers, consumers, animals, public health, the land, the environment, and the communities in which we do business is a tall order, but we can point to a number of programs and activities that prove we’re up to the challenge. Meet Megan Spence, a North Carolina hog farmer. Megan Sutton Spence is a proud North Carolina hog farmer and representative of the many hog farming families in our state. Born and bred in Eastern North Carolina, the 27-year-old lives and works alongside her family at Sutton Family Swine and Poultry, LLC. The only child of Mike and Nannette, Megan wasn’t always sure she’d work on the farm where she grew up, but after graduating from East Carolina University, she returned home to take a prominent place in the family business. Megan manages the swine portion of the farm and sometimes assists in the poultry business. She also helps tend to the soybean, wheat, and corn crops as needed alongside her father, uncle Gary, and cousin Garrett and their farmhands. “We’re a normal family striving to make a good life for ourselves just like anyone else. Our farm is our home. We do what it takes to take care of our land, our animals, and the buildings the animals are housed in,” said Spence. 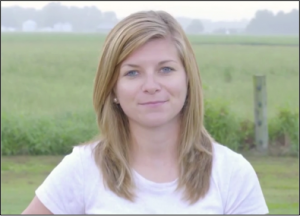 Learn more about Megan and her farm life.